The year was 1984, and Sensei Bob had found something he truly loved. He threw himself into training and soaked up as much as he could. Whenever possible, he was training. Once he enjoyed the freedom that a driver’s license afforded, he spent six days per week with his sensei at the YMCA in Fairfield, Connecticut. Training was hard and his teacher (then fifth-degree black belt) Sensei Ray Martens was intense. Sensei Bob attended the University of Connecticut from 1988 to 1993. He concentrated on his studies and trained diligently during school breaks. 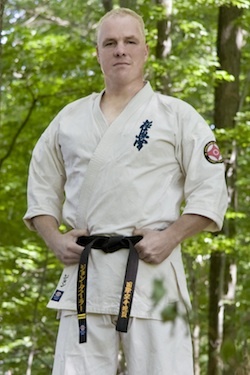 After he earned his degree in Computer Science and Engineering, Bob returned to training and was subsequently awarded his shodan (first-degree black belt) from Martens Sensei. After a hiatus during which Sensei Bob started a new business and had his first child with his wife, Alison, he began formally training again with his sempai (senior). In 1998, Shihan Ray’s most senior student, Glenn Learnard, started teaching Kyokushin karate as a member dojo (school) of the International Federation of Karate and Bob began training with him. Sensei Glenn augmented the normal Kyokushin syllabus and introduced concepts such as kyoshu Jutsu (vital point striking), kansetsu waza (joint locks/manipulation), and bunkai (analysis) of traditional karate techniques. Sensei Bob served as Sensei Glenn’s most senior student and helped to run the operations of the karate club. As time went on, Sensei Glenn gave Bob more of the teaching responsibilities of the dojo, and he served as the primary instructor in Sensei Glenn’s absence. Under Sensei Glenn’s tutelage, Bob earned his nidan (second-degree black belt) ranking in 2004 and was presented his belt by Hanshi Steve Arneil. In early 2009, several months after Sensei Bob had taken over the karate club, Sensei Glenn awarded Bob his sandan (third-degree black belt). In July of 2009, the new dojo was opened and, for the first time, classes were offered six days a week. Sensei went from teaching and training 6-8 hours a week to teaching and training nearly 20 hours per week. He has continued that schedule for the past couple years. In 2011, after over 25 years of martial arts training, teaching, and learning, Sensei Bob received his yondan (fourth-degree black belt) from Shihan Raymond Martens. Bob continues his own training as well as that of his students. His passion for karate has only intensified since becoming a sensei. He continues to expand his own knowledge of the martial arts as he delves deeper into the areas of full-contact fighting, self-defense, and improvement of the self through the practice of budo, the martial way. 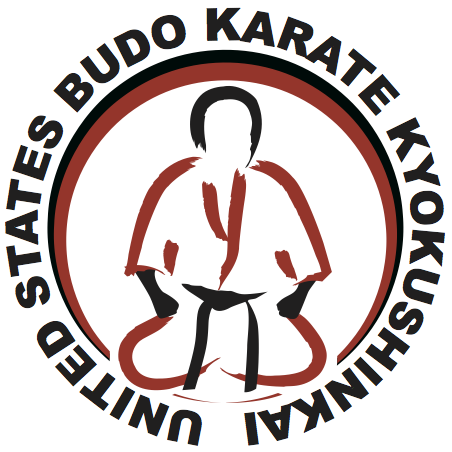 Sensei has four children who you will find helping and training at the Connecticut Budo Karate dojo (opened in 2009) with he and his wife. Bob is also a co-founder of Closerware, a provider of software-based services for not-for-profit organizations. The dojo is operated as a labor of love in addition to Sensei’s very busy family life and full-time job. Sempai Sue began her karate training in 1995 under Shihan Ray Martens, 6th Dan, at the Fairfield dojo. She has been training for over 15 years. Shihan Raymond Martens awarded Sempai Sue her shodan (1st degree black belt) in 2005 and her nidan (2nd degree black belt) in January, 2010. Sempai Sue taught a program designed to introduce young students to traditional karate training, at the Fairfield dojo, for 8 years. The program aims to help young students develop a positive, winning attitude and learn how to have the confidence in themselves to do the right things. Sempai Sue has been training diligently at the Connecticut Budo Karate dojo since 2010 and continues to strive to improve and learn. She teaches various classes and age groups and usually mixes her personal training expertise into her lessons. She provides a good workout, for certain! Sempai Sue hopes to give back by inspiring others, especially other women and young people. Sempai Sue is married with one child and resides in Trumbull, CT. She works for Cervalis, a premier provider of IT infrastructure solutions where she has served as director of human resources since 2000. She is also a personal trainer originally through National Academy of Sports Medicine. He favorite quotes and reflections on karate appear below. Sempai Mark Hopwood began training karate in 1986 as a 13 year old and trained through 1991 obtaining the rank of 5th kyu under Shihan Ray Martens before going off to college. He trained on and off for several years while completing his Bachelor’s degree from the University of Connecticut, getting married, and starting his first business venture. Mark returned to train with Sensei Glenn Learnard, Shihan Ray’s most senior student, in 1998. He earned 3rd kyu and took another hiatus before returning to his martial arts training for good in 2003, competing in multiple semi and full knockdown tournaments. Mark earned his shodan (first-degree black belt) from Sensei Glenn in December of 2006. Sempai Mark has been mentored his entire martial arts career and life by his brother, Sensei Bob Hopwood, who assumed responsibility for the dojo in 2009. Mark is honored to have his brother as his Sensei. Mark grew up in Trumbull and moved back in 2003 with his wife (also a Trumbull native) to raise a family. He has three young children, two of whom train regularly in our little dragons and kyokushin programs. Sempai Mark also works for Closerware, a successful web-based software business he co-founded in 2003. Born in Latvia, Edgar Silovs first began his martial arts journey at the age of 15 by studying from a book. The book, given to him by his father, was in the Russian language and titled, Boy’s Karate. Eager for more, in 1992 he responded to an advertisement in a local newspaper for a karate school. Classes were offered in two neighboring towns on alternate days. Edgar started training and went as often as he could, traveling to both towns and training six days a week. He searched the Internet found our site and started training in June of 2004. Edgar has represented our dojo in two full-contact tournaments: winning one and placing in another. In January 2010, Edgar successful passed his shodan test in front of Shihan Ray Martens. With his daughter also training with us, karate is a family affair! Sempai John grew up in Darien, Connecticut and after graduating from Darien High School served four years in the United States Marine Corps. He began his karate training in 1990 under Sensei Ted Oyama, 5th dan and later with Sensei D. Nazuka, 4th dan, with the World Oyama Karate Organization. Grand Master Shigeru Oyama, 9th dan, awarded John his 1st dan black belt in 1995. He participated in three full-contact tournaments, placing 2nd in one of them. In 2004, Hanshi Steve Arneill, 8th dan, awarded John his 2nd dan certificate. Sempai John works for the Fairfield Police Department where he has served as a police officer since 1989.